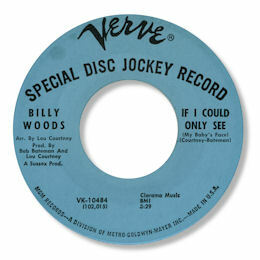 Billy Woods' final 45 for Sussex "Let Me Make You Happy" is one of those Northern tracks that fetch completely ludicrous prices but in truth it isn't one of Van McCoy's finest hours. Those "la la de da" lyrics see to that. The flip "That Was The Love That Was" is far superior with a better melody and more room for Woods to demonstrate his clear high, flexible baritone vocals. But to get the best of this singer you have to go back to the 60s and his pair of releases for Verve. No One To Blame is a classic uptown ballad full of great touches such as fine orchestration, lovely background harmonies and a singer whose gospel background is clear and unambiguous. The way Billy slides around the song is just delicious and the hook to the melody is first class. You gotta love the falsetto bursts in the run out groove. But if that was good If I Could Only See may be just a shade better. The arpeggio piano and the bluesy cadences Billy sings are sheer class, just check out the way he gets rough and ready on the second verse and into the chorus. The arrangement, particularly the horn charts, make this a stand out Big Apple cry ballad.